This is described on IMDB as a comedy thriller. The comedy is pretty much as dark as you can get; so dark as to elicit no smiles from this viewer. There are elements here that suggest darker forces are at work but really the darkness manifests in all sorts of ways; mundane or extreme. Pat Healy plays Craig a man who loses his job on the same day he is given his eviction notice. Craig has a wife and a baby and is at the end of his tether. He’s sat in the bar and in comes Vince (Ethan Embry who was brilliant in Brotherhood) his erstwhile teenage buddy, they sit, reminisce and meet a couple played by David Koechner (Whammy) and his wife Violet (Sara Paxton) who are clearly loaded. The couple dare the old friends to do more and more bizarre and twisted things for money. And there is the premise. How far would you go if you were at the end of the road? This pitch black thriller is definitely not for everyone especially the squeamish but it is well made, the acting is real and the script is sturdy. Everyone is excellent and convincing. This is E.L. Katz’ debut feature and doing a bit of research it seems that his genre is horror so it’s unlikely we’ll see his name anywhere different than this niche market. My question is why would you make it? A little bit like Prisoners, the Hugh Jackman/Jake Gyllenhaal thriller, well made but to what end? Maybe it’s shock for the sake of it; no more, no less. If so, a wasted venture methinks. It does shine a light on the darker and does it in an interesting way but it could have gone further down that line of questioning. ‘For the love of money is the root of all evil’. Dark, disturbing and borderline demonic; for true extremists only. A cool interview with Pat Healy by thycriticman. 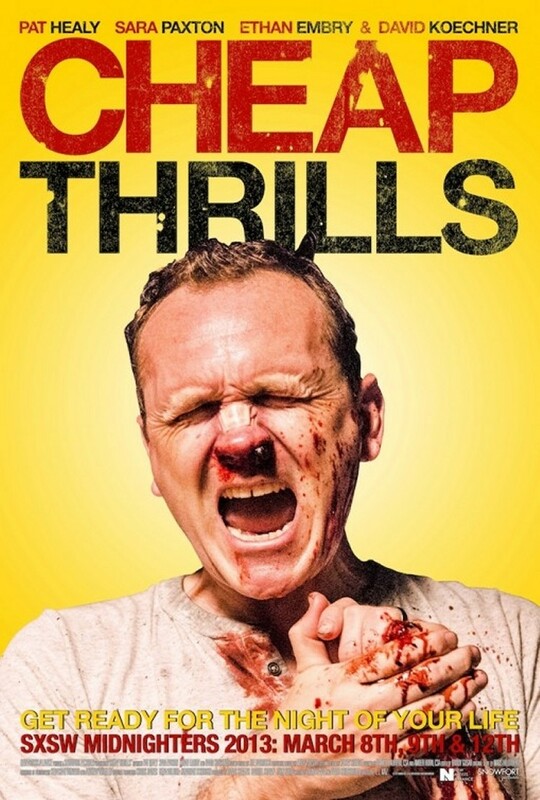 Healy is the star of Cheap Thrills. The film is worth watching for his performance.